Tommy Midyette has been a full-time visual artist for 30 years. Most of that time has been devoted to painting portraits of people, pets and buildings; making sure his customers are happy with the results. You can commission him to paint portraits, but he's also capable of painting murals, decor art and more. Tommy has sold many pieces through art galleries. You can purchase these works directly from Tommy or from specific sites mentioned on this website. 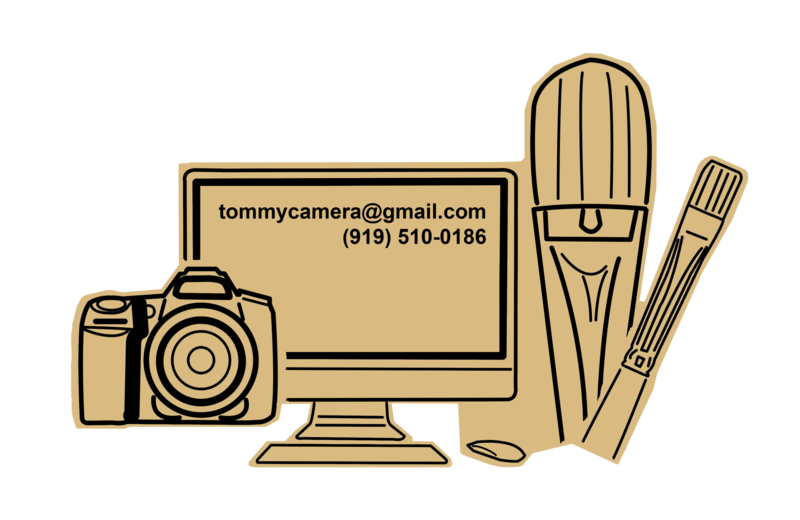 You can hire Tommy to be your photographer or videographer, as well. All of Tommy's paintings are made from scratch. (except for when customers ask for a photo image to be enhanced with paint). Oil paintings are done on white long-lasting canvas. Pastel portrait paintings, charcoal portraits, colored pencil portraits are all done on paper and need to be framed under glass. Pet portrait paintings, Bridal portrait paintings, Building portrait paintings, are done on canvas or paper. Tommy will do his best to satisfy whatever visual art needs you may have. He can paint by referencing a customer's photos or can be hired as a photographer. Your old black and white photos can be turned into a glorious colorful painting! He works from his studio in Raleigh, NC. Add yourself to my art collectors mailing list !